The title Billionaire Club does not refer to the billionaires mentioned in the Forbes list of Billionaires. It is a name of an extended pub or nightclub in New Delhi. While the prices of everything is ten or fifteen times the normal, the noise is at same decibel level as in any party. Young, mostly in couples bubble up their night on champagne, while some may also be drowning their sorrows in liquor, expecting to cheer up with loud music. Booze has a quality that it can bring out the best and the worst out of a person. 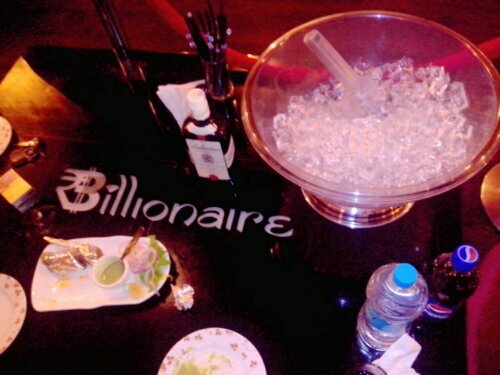 After long nights, preparing for debauchery, frequently these aspiring billionaires (for Forbes list) get to see their other side. The management finds no explanation for having fork holes or some more violent signs of catharsis in upholstery. Occasional brawl ends what started as romantic evening, throwing in the wisdom of Buddha who had long ago explained that nothing in this world has any intrinsic value. By the way, I did not personally stay that long. In fact I left even before the arrival of DJ. They do serve tea and the server did tell me that it was for the first time he served tea in his short career of about a year. They had no cookies or wafers or peanuts. Though ample of cooked, fried, baked and roasted delicacies. The vegetarian ones, we tried were excellent. But it had to be watered down with pint of Corona. Earlier the name of this place was different. Curiosity led me to ask as to which of the owners, selected new name. Reply is irrelevant but the knowledge that the change in name brought in extra business was revealing. They explained that the new name truly represents what they were offering. They did not was to be ‘rent a stool’ kind of pub. They were offering services to a niche class who could afford to spend more in one night what a Class 1 Govt. Official earns in a whole month. Upon asking about the quality of the rich brats, as human, the answer was they are human with all the traits. They have many Bouncers to manage the humans. Rest about the people, has already been explained earlier above. To find a quite, decent and hygienic place to spend some time is one thing but here it is different. Like all places of this type, does it offer an escape from daily drudgery of life or is it really a place for romance? Is it a place to enjoy music, sources of which keep changing from known to unknown stars, shining or blinking? Staying up till 2 or 4 in the morning is pleasure or labour? Perhaps they have nothing to do in the day except to sleep. What if the money does not run this place? Will the crowds, who come to spend, come? It may invite free lunchers but those with money will have to find new place to spend. After all what to do with money if not to spend. What is the point of having money if it can not buy good times, whatever that means. Money brings such a compulsive tethering to buy. While miser ancestors may not agree but Billionaire Club will keep thriving on the patronage of rich and lonely, looking for their money’s worth. A place worth visiting indeed. This entry was posted in Life, LifeStyle and tagged Billionaire Club, extravagance, Money, Rich, wealthy. Bookmark the permalink. Hello, I’ve nominated you for the Liebster Award. Keep up the good work. Thanks but I have yet to find what it means. Shall revert ASAP.